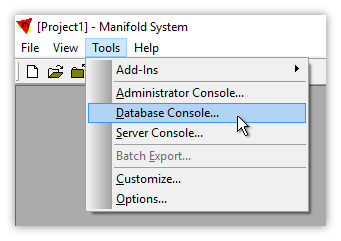 This topic provides a step by step procedure to connect from Manifold System Release 8 to a Manifold .map file using Manifold's ODBC driver. See the Notes at the end of this topic for general advice on interoperability between Manifold Release 9 and Release 8. Use an ODBC-aware application that provides dialogs to create an ODBC data source. Manifold System, Radian Studio, Manifold Release 8, LibreOffice and Microsoft Access are typical examples of applications which support creation of ODBC DSNs through their menus and dialogs. This example uses Manifold Release 8 itself to call the ODBC data-creation dialogs. This example shows how to use Release 8 to create an ODBC data source. 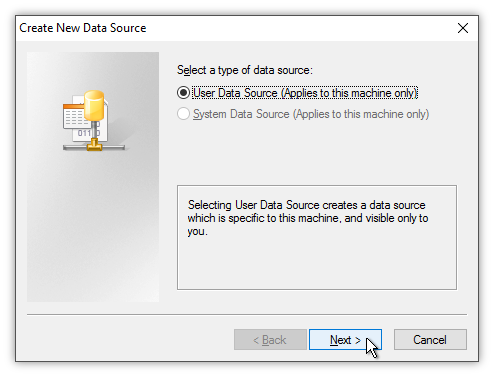 In both ways of creating a new ODBC data source both Microsoft dialogs and Manifold dialogs will appear. Both Release 8 and the Windows tool will call Microsoft dialogs as part of the process, and those in turn will utilize the Manifold ODBC driver we specify. As part of the creation process, the Manifold driver will open its own dialogs to enable specification of options supported by Manifold. 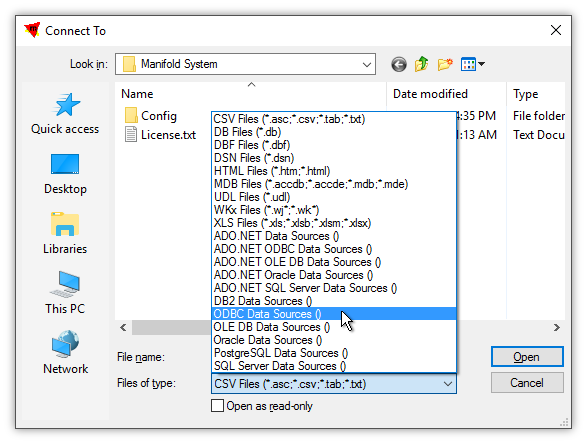 The primary choice offered by the Manifold ODBC driver is whether the new ODBC data source will connect to items stored in the .map project file, or whether the new ODBC data source will connect through the .map project file to provide access to external data sources that are linked into the project. 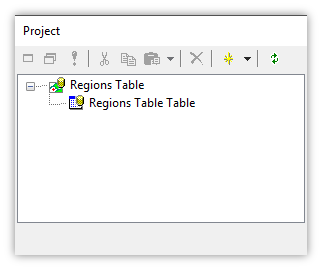 In this example we show the simpler case of Release 8 connecting via ODBC to components stored within the .map file. 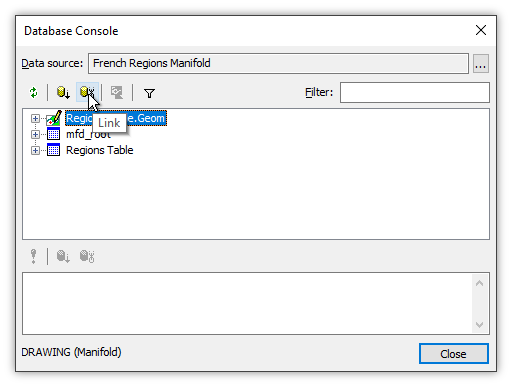 A companion example topic, the Example: Connect Through Manifold ODBC to a Third Party topic, shows how Release 8 can connect via ODBC through a Manifold .map project to work with data in an ESRI GDB file geodatabase, a data source for which there is no direct connection capability within Release 8. We will connect to a Manifold .map project file for the project shown below, a simple project with one drawing and the table for that drawing. 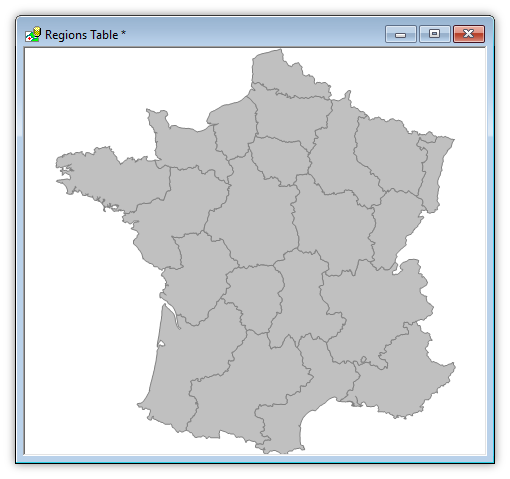 The drawing shows regions in France with the table providing the name and official number of the region. 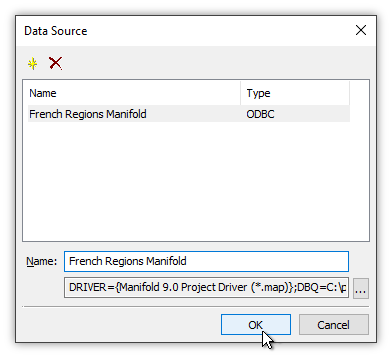 An ODBC Data Source must be created for each Manifold .map project file to be accessed by Release 8. 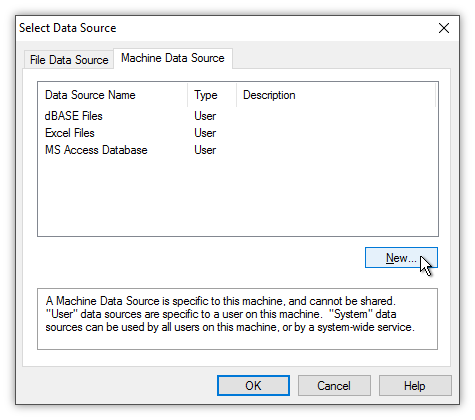 We can do this using Release 8 or we can use the dialog built into Windows as described in the Example: Create an ODBC Data Source with Windows topic. 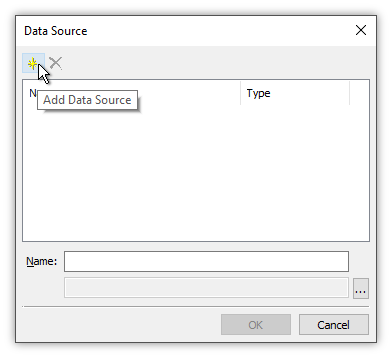 Once an ODBC data source is connected using the Windows tool we could, of course, use it within Release 8. Some times it is simply more convenient to do the process in Release 8 so in this example we will show the entire step-by-step procedure using Release 8. Click on the Machine Data Source tab and then click the New button. Windows opens a dialog with one choice available. We click Next. The ODBC driver for Manifold is common to all Radian-based software of the ninth generation, so it is called the Manifold 9.0 Project Driver. Click that to highlight it and then press Next. Windows provides a confirmation dialog to which we press Finish. That allows Manifold's ODBC driver to go to work. We provide a name for the ODBC data source that will remind us of the .map project it uses. Press the [...] Browse button to select the .map file to be used. We navigate to the folder holding the .map file to be used, click on it to highlight it and to load it into the File name box and then we press Open. 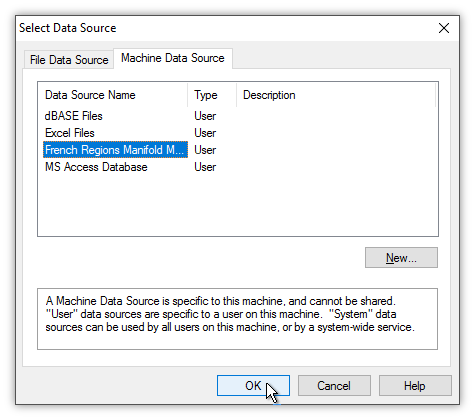 Back in the Manifold ODBC Data Source dialog we confirm the name of the data source is what we want and the specific file chosen is OK. Press OK.
Back in the Data Source dialog we see that a new ODBC Data Source has appeared. 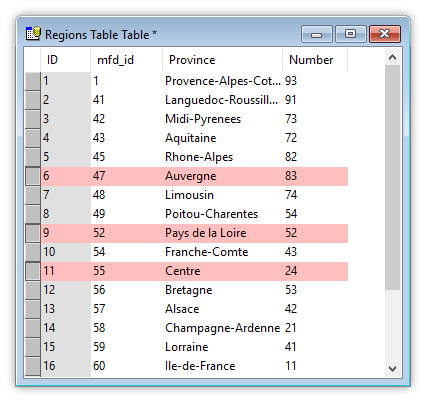 Unfortunately, this does not take its name from the Machine Data Source that was created, so in the Name box we give it a memorable name, in this case French Regions Radian. As we enter a new name in the Name box it appears in the dialog list above. Press OK.
We have endured so many ODBC dialogs we may have forgotten that all this started way back in the Database Console dialog. Now we have our reward of seeing the data source appear in the Database Console dialog, showing drawings and tables that we can utilize as described in the Database Console help topic for Release 8. The project we used as an example is a very simple one, with only one table and a drawing to show the table. To display the drawing we click on it to highlight it and then we press the Link button. That will dynamically link the drawing into our Release 8 project, leaving the data stored in the Manifold .map file. 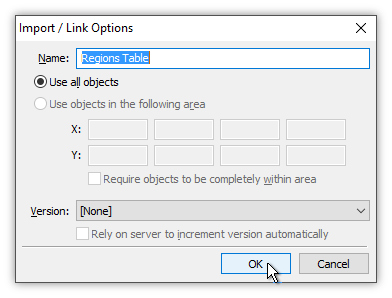 In the Import / Link Options dialog we press OK. The result in our Release 8 project is a linked drawing. The yellow database cylinder added to the icon indicates it is linked in from an external source. 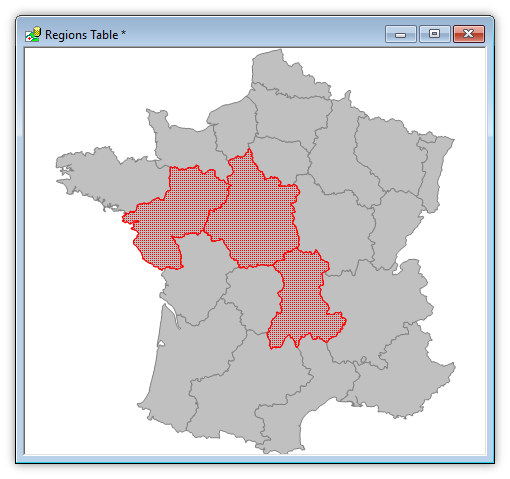 Clicking on the Regions Table drawing to open it we see it is a drawing of regions in France, as used in many of the example topics for Manifold. We can use that drawing in a wide variety of Release 8 operations. For example, we can click on various regions to Select them. If we open the drawing's table we can see records in the table that have been selected corresponding to the area objects we selected in the drawing. We can use Copy with a Ctrl-V and then do a Paste into the project to create a new, local drawing that consists of the areas that were selected. 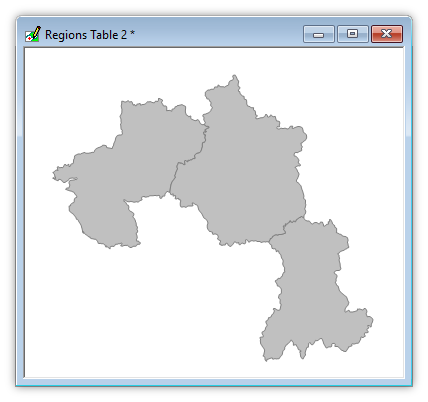 Opening up the Regions Table 2 drawing we see that it indeed does contain the three areas that were selected and then copied and pasted as a new drawing. 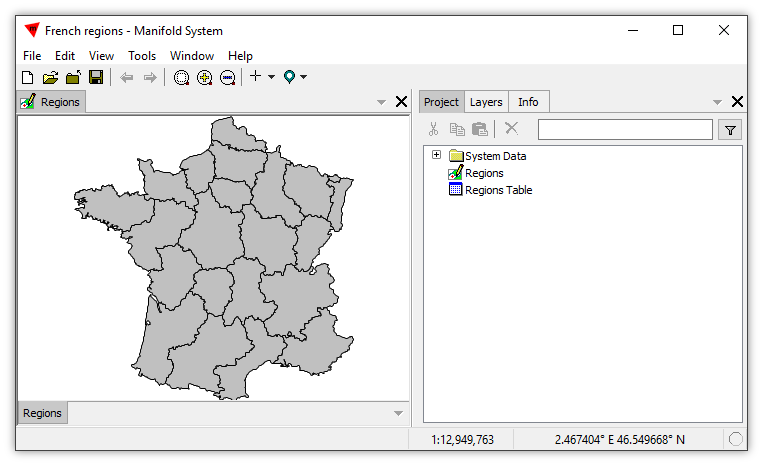 Historical regions - The illustrations in this topic use data from the US government, which show the regions of France as they were before 1 January 2016, when regions in France were reduced from 22 to 13. To work simultaneously with the same data using both Release 9 and Release 8, use a multiuser database to store the data. Both Release 9 and Release 8 can connect to many different multiuser databases to read/write data. 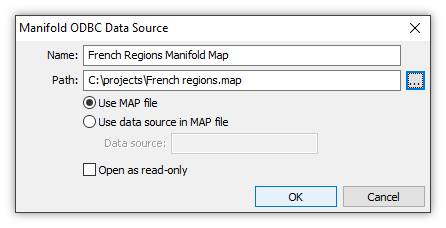 To utilize data from Release 8 within Release 9, launch Release 9 and open the Release 8 .map file. From Release 9, save that project using a different name for the .map file since a .map file saved by Release 9 is not readable by Release 8. 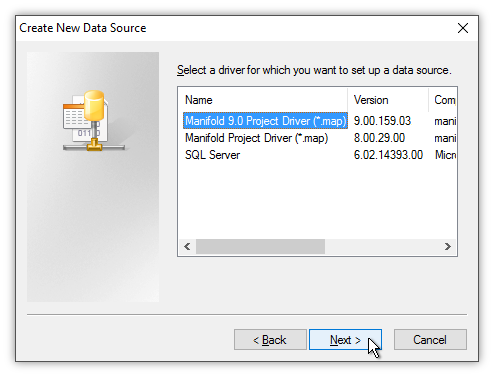 To read/write data from either Release 9 or Release 8, and to maintain the data in Release 9 storage, keep the data in a Release 9 .map file and connect to it from Release 8 using Release 8's built in ODBC driver for connecting to Release 9. The most recent Release 8 updates include an ODBC driver for Release 9. To read/write data from either Release 9 or Release 8, and to maintain the data in Release 8 storage, keep the data in a Release 8 .map file and connect to it from Release 9 using Release 9's built in ODBC driver for connecting to Release 8. 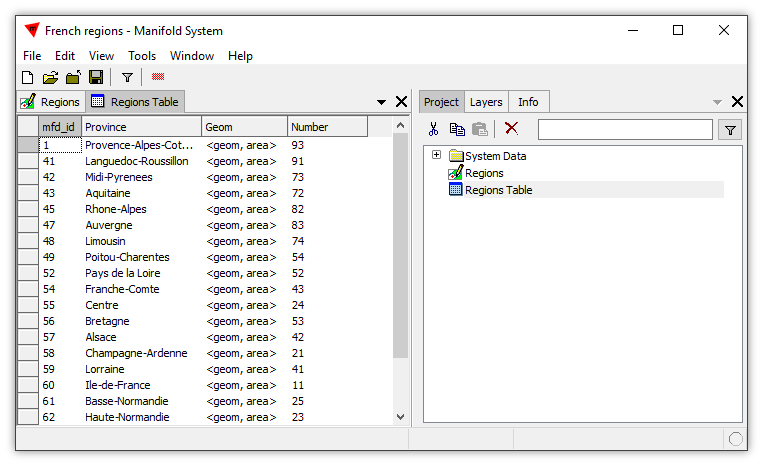 To interchange data using a third party format, export data from either Release 9 or Release 8 to a format such as shapefiles that both Release 9 and Release 8 can import.